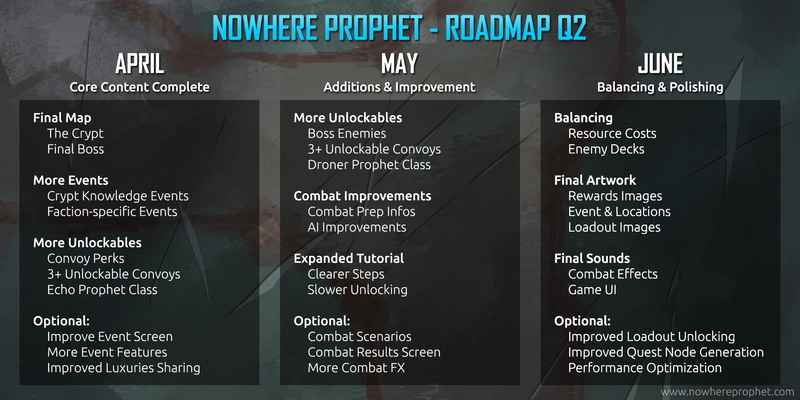 After the Q1 roadmap it's now time for the Q2 Roadmap! You can see it all in the image above, but let's go through it one by one. 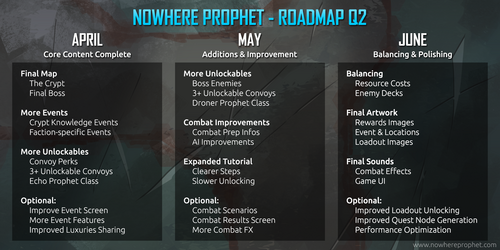 You'll notice that in contrast to the last Roadmap I've put in goals for each month. That means it's less about the releases and what goes into each one, but rather about the overall project goals. I still hope to release TWO updates each month but the content takes precedence and may change this. You'll also note that I've added a bunch of optional actions to each month. These are not needed but would be great to have to improve the game. I clearly marked them as optional as they may slider into later months or vanish altogether. Also the goals make it easy for me to reevaluate at the start of each month to see if it is still current, and if the actions planned are still in line with it. This means that I want the game to be functionally complete by the end of April. That doesn't mean that everything I want in there will be in but that the "minimum" required to play the game from start to finish should be in. Originally planned for February, it's finally time to add the last map: The Crypt! This also includes the final boss and a bunch of other content that needs to be added or improved. But it will come! There's still a bunch of events missing - such as fortifications for certain factions or the last set of Crypt Knowledge events. A bunch have been written up already, while others are still under constructions. However they all need to be translated into the game and added. With the final map, there will be more conditions for unlockables. That means a bunch more Convoys will be added, and another class - The Echo. This will also come with the Convoy Perks feature, which will allow additional features on each Convoy that can be unlocked through play. The Event screen has existed in its current incarnation for almost two years and some things have changed in the system. For example the changed follower system means you don't really know which follower is speaking since you can't see the card. Also the text is sometimes awkwardly squished. I have ideas on how to improve the screen but that's not really an essential task. It is also a large task that's difficult to estimate since finding a better layout can take a wildly varying amount of tmie. In addition to the improved event system I've been thinking of adding more features to the event system, such as upgrading followers. However this is a bigger change that would also cascade into the content - i.e. existing events would have to be touched, so it's on the maybe list. The sharing of items with the convoy is an important action but is this very minimal thing. There's an idea that sharing an item can sometimes trigger events related to the item, to show off the convoy some more. There's been work done on boss enemies, so these would have to be integrated into the game, and with them unlockable convoys and another class. There's also a number of visual and interface improvements I want to make to combat (specifically the combat-prep screen and the AI). The tutorial could also use some more work. Optional for may is some more combat stuff: Improved visual effects, and improved results screen and some combat scenarios via events. Twists on combat that can affect the way matches are played. Think about a combat where both sides start at 1 Momentum, or one where you gain 2 momentum each turn. Or a combat where destroying an obstacle is another optional victory condition. The goal for June is to take all the content that's been added and making it shine. At the heart this means balancing unit stats, resource costs and enemy decks to make for a better play experience. This also means finally adding the proper artwork and sounds for all parts of the game. Optional goals are to improve the loadout unlocking. To make it a manual action that gives you some insight into the convoy you've unlocked. To add some more flavor and show off more of the world. Also I want to improve the Route Generator in how it picks Quest Nodes. Lastly while the game is running pretty well I want to look into optimizing performance so it runs better on older/weaker systems. And that's the current plan.